First let me show you this add. The Red FED, built in a limited editon during the Cold War on orders of the Seventh Directorate of the KGB, also known as the "Spyshop". Characterized by an Exemplerary finish this FED 5b is a truely unique item for every collector. Equipped with the fantastic FED/Industar N-61 2.8/52mm Lanthane lens for optimum optical accuracy. Made in the FED Machine Works, Kharkov, Ukraine (formerly USSR). Home to some of the finest Optical plants in the world. This camera can be yours for only 100 dollars. And comes with the original ever ready case made from the finest leather available. You can also get the complete set as given to KGB members for their work on behalve of the people of the Soviet Union. 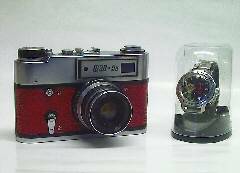 The FED 5B and the Vostok KGB watch (selfwinding) for only 150 us dollars. The watch is waterproof, shockproof, has a metalband and comes with displaycase. Be the envy of all your friends and order now. Is all that is stated above true? Because it sounds great! No it is NOT true ! I painted it this way ! This is a HOAX and I made it, on purpose by the way. Because I wanted to make a statement here. This fake was very easy to make and the story well.... it's easy to dream up a story like this. Nobody will verify it, or knows how to verify it. 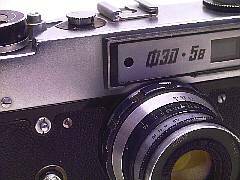 A good FED 5B by the way is sold for about 30 to 40 dollars. But I've seen prices around 75 up to 120 dollars. So don't get fooled by adverts. That is what I'm trying to say here. Take the time to check out stories or rumours. It saves you money. 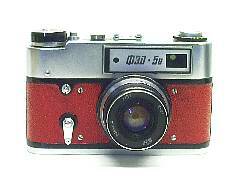 The FED5B was NEVER produced in red like this. It has just a few minor variations and the most famous one is the Moscow Olympic games variation. The other variations had to do with the film cartridges. About 226.343 were built from 1975 to 1980 but mass production started in 1977. Then why did I paint it this way? It didn't cost much, about 15 dollars on a fleamarket. Come to think of it it was too much for a broken camera. It was broken when I bought it, the shutter works but the lens was solid, focussing was not possible (thats why it was cheap). There was this ugly sticker and white paint on the back. Reasons enough to do something crazy and break one of the collector laws. Thou shalt NOT alter or improve upon the apperance of your camera ! Thou shalt only repair ! This isn't exactly true. This FED has a lens with lanthane glass and I have heard good things about it. 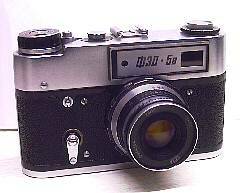 The camera, allthough built like a brick, works ok. I found the 5B to be a good handler and allthough the design could be better it makes a good workhorse. The rangefinder is accurate. It takes my other L39 lenses (all Jupiters) without problem. It lacks a lightmeter but I have a handheld lightmeter so no problem. Funniest comment, " is that the new Nikon 4 megapixel?" The fotos came out good. There is no reason not to use it. It just is a good camera. But fact is, it looks much better now it painted.